Tearing through reviews again this week I bring you Emilio Cigar’s sequel to the AF1 that I reviewed here, The all new AF2. The Good Stuff: Emilio Cigars is the brain child of Gary Griffith who is a certified Retail Tobacconist that oversees the operations at Delaware cigar. Gary teamed up with master blender AJ Fernandez to bring you both the AF1, and today’s AF2 cigars. 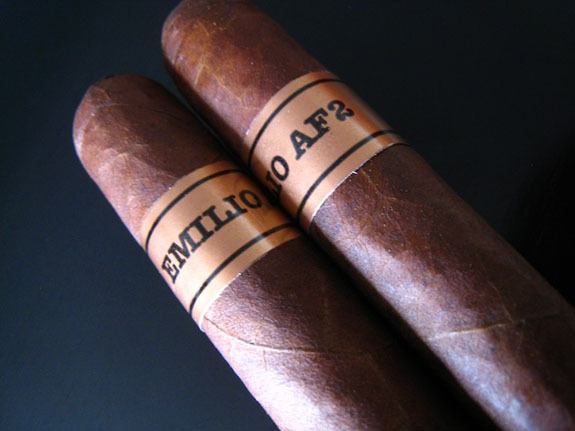 The AF2 is actually the third cigar in Emilio’s portfolio. The AF1 was the first blend, shortly followed by the Grimalkin which was not blended by AJ, and now the new AF2. The AF2 is composted of Nicaraguan and Pennsylvania Ligero wrapped in a Ecuadorian Habano Oscuro wrapper. The AF2 will be available in 4 sizes, the Robusto (5×50), the Toro (6×50), the Torpedo (6.5×52), and the BMF (6×58) and will run between $7 and $8 a stick. Prelight: Along with the AF1, Emilio’s AF2 sports flawless construction. The cigar starts out with this beautiful oily and toothy wrapper. The wrapper is a nice dark brown, with lighter spots and even some orange coloration here and there. 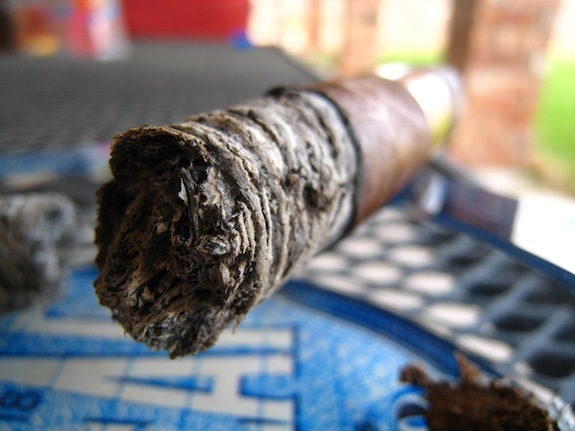 There are a only one or two large veins running half the length of the body of this cigar. The AF2 is then capped off with a traditional round double cap. 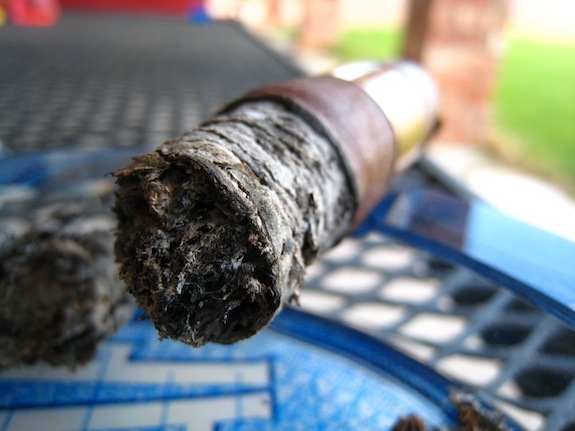 The cigar is firm for the most part with only one softer spot near the simple black and copper band. But nothing that I’m too concerned with. The wrapper feels really tough and durable. The wrapper of the AF2 gives off a very nice oaky, and musky aroma while the foot bears a more traditional tobacco and grassy aroma. The wrapper gave a slight bit of push back, but then clipped clean using my Palio double bladed cutter. 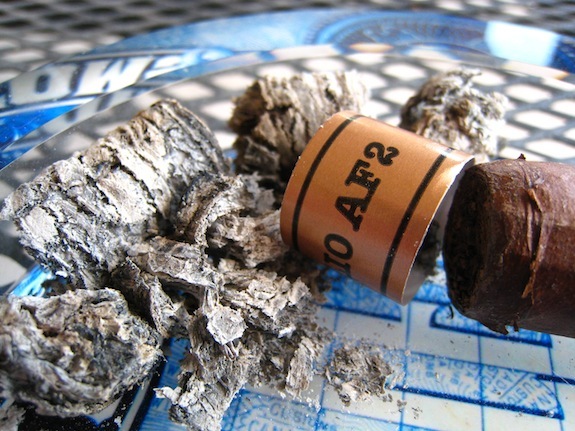 The cold draw on this AF2 is dominated by a spicy ligero flavor backed by some slight wood and earthy flavors. First Smoke: The AF2 leads in with an extreme amount of pepper. The pepper quickly fades and I am left with the really sweet tobacco, oak, cinnamon, spice, and honey mixture. It’s a far cry from the dominant ligero based flavor I picked up in the cold draw. And that’s a good thing. Too much ligero in my opinion, can quickly ruin a cigar (Both burn and flavor wise). 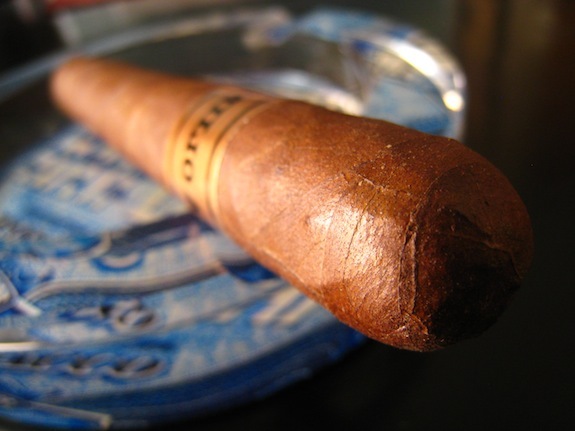 The draw on this cigar is effortless pumping out thick, heavy smoke with even the smallest draws. The AF2 doesn’t give off a lot of stationary smoke, however I found it interesting that the smoke it did give off was so pleasant scented. Much like wood burning in a fireplace. The AF2’s burnline is razor sharp and dead even leaving behind a very nice trail of light grey, tight, compacted ash. Halfway There: Into the second third of Emilio’s AF2 the pepper has completely removed itself from the flavor profile. What I was left with is again, lots of sweet tobacco, oak, honey, and some nice graham cracker type flavors. You can taste the ligero in this cigar but only slightly, leaving it very balanced. The way it should be. Despite having a ligero based blend the cigar really isn’t giving out a ton of nicotine, if any at all at this point. Surprisingly too, the retrohale on this cigar is really smooth coating my nasal passage with a nice woodsy and spice profile. The burnline is still super sharp, and dead even. Finish: This AF2 is finishing so smooth! I really wasn’t expecting that. Still, only a very slight amount of nicotine. I love when blends can really balance themselves out and have so much potential to be powerhouse smokes, but end up medium/full with an overall smooth complex. The AF2 falls right into that category. The pepper made a slight reappearance into the finally third, but that oaky flavor I mentioned has really taken control. The sweetness is still there slightly, with a bit of the honey, but now the experience is so much creamier. Might I say milky? Either way, this is exactly how I wish every cigar would end. This cigar took about and hour and a half total to smoke down. Overview: AJ Fernandez and Emilio Cigars have produced yet another winner. This blend compliments the AF1 very well, but is different enough not to be compared with the blend. 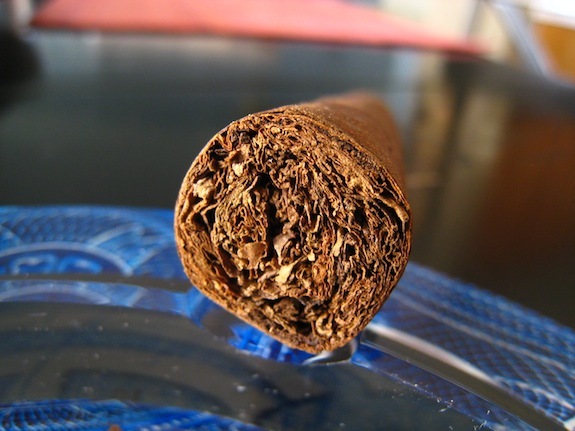 The cigar has plenty of body to satisfy full body smokers, but is smooth enough all the way to the finish for the masses. The flavors are complex enough, and extremely pleasant and well balanced. The construction was spot on, and the price is right where I would expect it to be. I can’t really say anything else. Buy them. By the box. You won’t regret it. 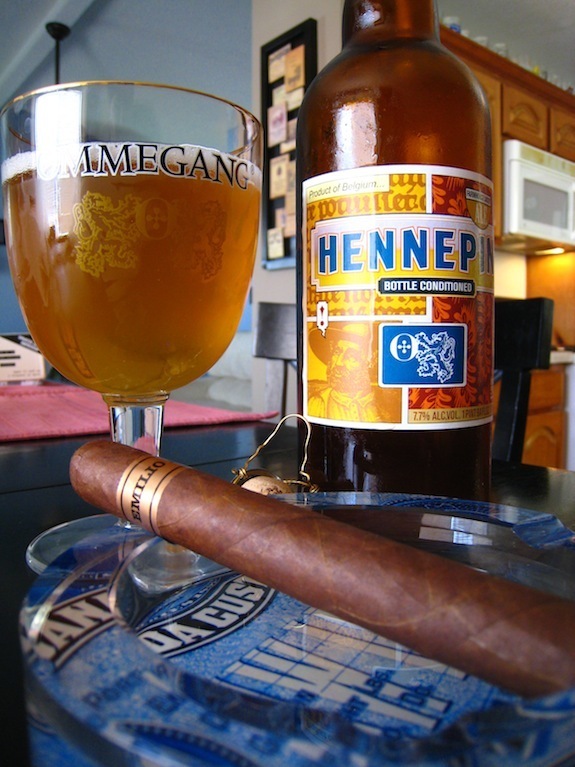 Pairing: I paired this Emilio Cigar’s AF2 with a long time favorite, and one of the best summer brews around. Omega’s Hennepin Saison. Hennepin is a very tart, citrus infused farmhouse ale. Pale in color, carrying a 7.7% ABV it makes for a perfect afternoon refreshment. The wonderful wood and cinnamon flavors from the AF2 matched perfectly with the sharp citrus Hennepin kicked out. 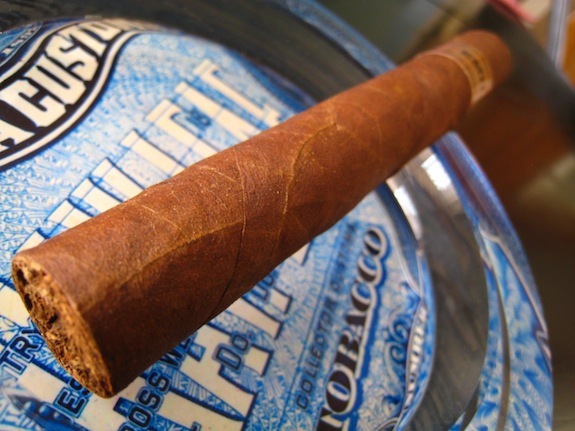 This cigar would go perfect with any light ale, an IPA or some ice tea. I’ve really enjoyed everything from Emilio and Gary. All three are exceptionally well made and balanced and suit my tastes (no easy feat). Once again, you’ve done a wonderful job of putting the smoking experience into words, a talent that I wish I posessed. Oh but you do Craig! I simply just type out whatever is on my mind 🙂 I too have enjoyed smoking through Emilio’s line. Its a big up and coming boutique blend that has real potential in becoming one of the next big brands. 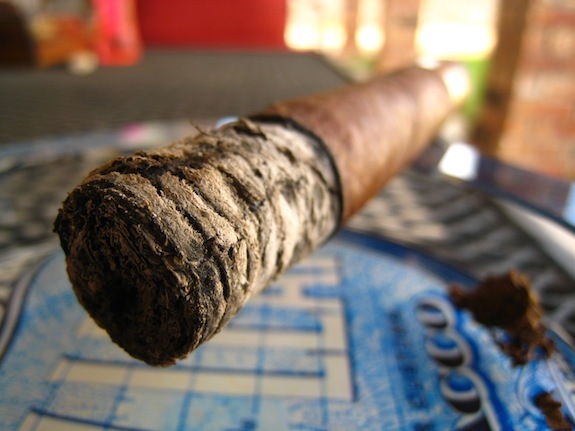 Once again, your fine prose has got me craving the cigar being reviewed. Now I’m going to have to hunt around town to see if I can come up with one of these. Another great review! I too am now craving a cigar! hahaha, Cheers bro! JJO – Doesn’t look like there are any up there listed. But I am sure if you get in contact with Gary through his website he can point you in a better direction on where these might be available to ya! Thanks Alan and Tony. I did go to the website ealier and there are no retailers in my area listed. I will contact Gary sometime soon.